You may have read a lot in the news recently about wearable cameras - US President Barack Obama has just asked Congress for funding to supply 50,000 of them to police departments across the States. But while Obama's intentions for the wearable cams are crime prevention, there are more everyday uses for them. Wearable cameras capture the action of your life - whether that's biking down a ravine or hitting the beach with the kids - without you having to dig your phone out of your pocket and frame a shot. The term "lifelogging" has been coined to describe the process of capturing all of the day's minutiae and then editing it down into a series of moments; your very own highlights reel each evening. It's not a category with an abundance of options, though that will change as the available hardware components become more capable and the associated costs drop. The stand-out device right now is the Narrative Clip, previously known as Memoto, but there are some alternatives around that are also worth considering. Action cameras such as the hugely popular GoPro range can also fall into this category. If you're going to be carrying a camera around with you around the clock, then it needs to be as invisible as possible - otherwise the people you come into contact with are going to be constantly grinning, grimacing or running for cover. As well as being discreet, a lifelogging camera needs to be comfortable to carry, so you can take it along for a run down the street, a night on the town or even a dip in the ocean. 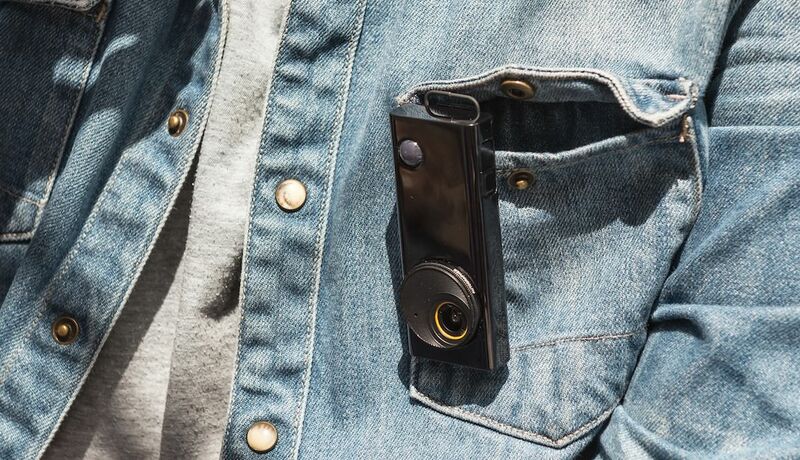 The Autographer camera (£299 / $399) tries to be as innocuous as it possibly can, but - like the Narrative Clip - your friends are always going to spot it. You can clip it to your clothing and it uses a variety of sensors (including an accelerometer and a thermometer) to decide when the best moments to take a picture are. Also of note is the wide-angle lens, which gives it a slight fish-eye look and takes in more of the surroundings. For most digital cameras the headline specification is the number of megapixels offered by the lens and the resulting size of your images, but with dinky wearable cameras the emphasis is on storage rather than photo quality. Don't expect these cameras to give you shots on a par with a smartphone - both the Narrative Clip and the Autographer carry a 5-megapixel snapper in their compact cases. As with your mobile, the amount of storage on board your wearable camera is going to affect how many photos and videos you can save before syncing back to your computer. Again, the two main contenders have the same specification here, with 8GB of on-board storage available (the Narrative Clip comes with the option to pay for accompanying cloud storage). The MeCam (from $49) offers either 4GB, 8GB or 16GB of storage, but its lacklustre photo quality means it's more of a novelty than a serious gadget — one for the kids to use, perhaps. If it hasn't already clicked, logging your life produces a lot of images. The job of enabling you to sift through these mostly humdrum and forgettable pictures to find the highlights is given to the apps and software that accompany your camera. The Narrative Clip, for example, uses an algorithm to study the make-up of each picture and decide which ones are worth keeping; if you don't trust the software to make the decision for you, then you can browse through all of the images yourself. Both the Autographer and the Narrative Clip have accompanying apps for Android and iOS, while the Autographer comes with a desktop package as well. For something with a truly advanced on-board operating system, there's the option of Google Glass, now available to anyone with £1,000 to spend. Glass runs a cut-down but very capable version of Android, and as well as picture and video recording you get phone alerts, directions, Web searches and much more right in front of your eyeballs. For now though, Glass remains an experimental product that will only appeal to the most enthusiastic tech early adopters. If you're looking to capture bursts of video on demand rather than a continual stream of images then a compact action camera might be more suitable. These pocket-sized camcorders can be clipped to clothing, handlebars or a helmet and are capable of recording some stunning footage — take the GoPro Hero 4 (from £290 / $399), which can capture clips at a 4K resolution. The Sony range of action cameras also offer powerful specifications in a compact (and waterproof) casing. There are also the privacy implications to consider; should you be filming and photographing other people without their knowledge? Covert recording is much easier with a wearable camera, and it's something that has caused a headache for Google Glass developers. The Autographer solves this problem by using a colourful lens cap that indicates you're not recording, and it's something to bear in mind when making a choice.